Tonji is now worried that we have too many Grass Owls in the farm. 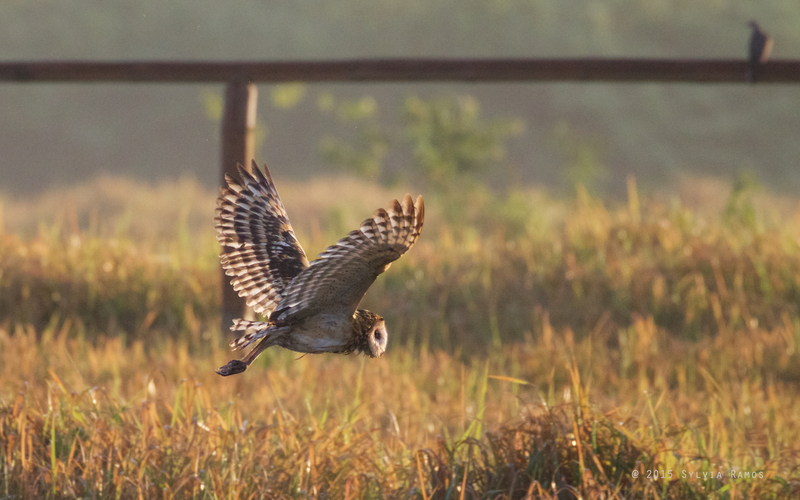 When we started this conservation project three years ago, we would see one Grass Owl passing through our area. We would see it flying in the distance, probably headed towards the area with the tall grass on our neighbor’s side. Our side was covered with very short, stubby grass. The result of years of over grazing by cows and carabaos of the former owners. The land wasn’t planted to crops, except for one small corn patch. The rest was pasture for cows that were being fattened up for the market and some carabaos. And there was also the patch where they were making charcoal out of the trees. Our first step was to boot out the carabaos, cows, and charcoal making and allow the grass the grow again. After a year of this, we noticed that there was a Grass Owl living in the part we called “The Lot With the Other Pump” because there’s another pump there. When disturbed, it would fly out from the tall grass, then dive back inside again. After a year of letting the grass grow, it started getting very difficult to walk around. We realized that we would have to manage all that grass. Tonji designed a network of meandering, scenic trails to curve around the different areas of the property and cut them out with a tractor. The trails would also serve as a fire break. We were also crossing our fingers that the trails would be a snakebite-free zone. The theory being that if we stayed on the path, we would be less likely to encounter any snakes. And if there was a snake on the path, it would choose a quick and easy retreat into the grass rather than a confrontation with us. Once the paths we cut, we noticed that the birds also like the paths. Just as we had seen when birdwatching in other areas, birds like to hang out in the the edges of things. Making paths creates more edges for the birds to use. They also look for insects and other goodies that have turned up in the paths, especially when the path is fresh mowed and the new grass is sprouting. This explains why chickens keep crossing the road! Making the paths also kept us out of the sections of taller grass. This left those areas not just for birds, but also for all sorts of plants, insects, and even mice to thrive. Whenever Tonji would return from cutting trails, he would remark about all the mice he saw jumping out of his path. More food for the owls! When wild birds and other wild animals face an abundance of natural food in their environment, the don’t stuff themselves and get fat. Instead, they reproduce. This year we’ve seen a noticeable increase in the owl population. 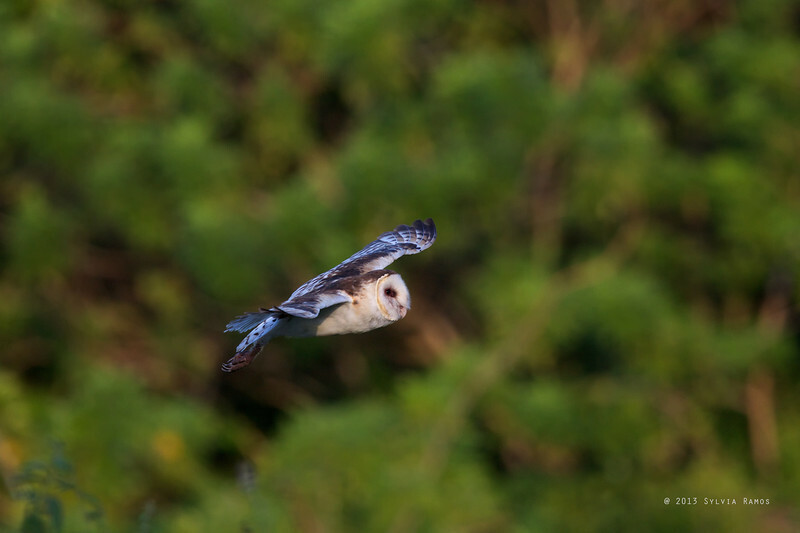 Last month we wanted to take photos of owls in flight. We went out into the grass at dusk. 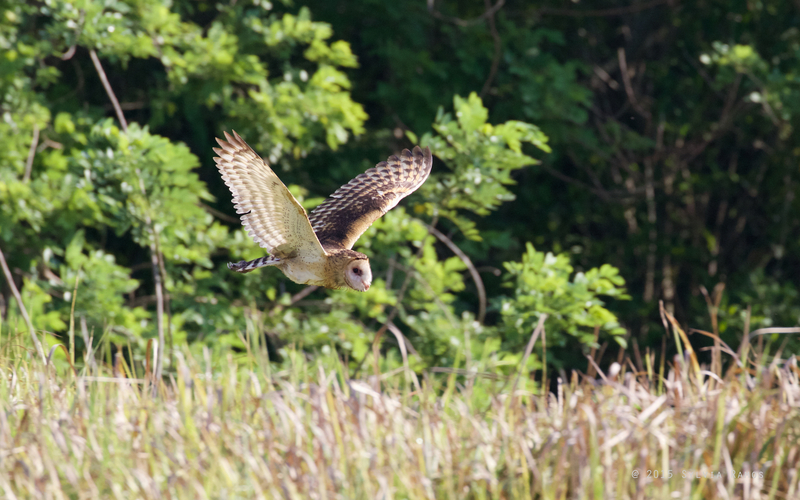 We saw 7 Eastern Grass Owls taking off from the patch of grass in front of the cottage! Later that same evening we heard 4 Philippine Scops owls calling from the trees. Tonji thinks there are at least 3 other pairs of Eastern Grass Owls that stay in other areas of the property. 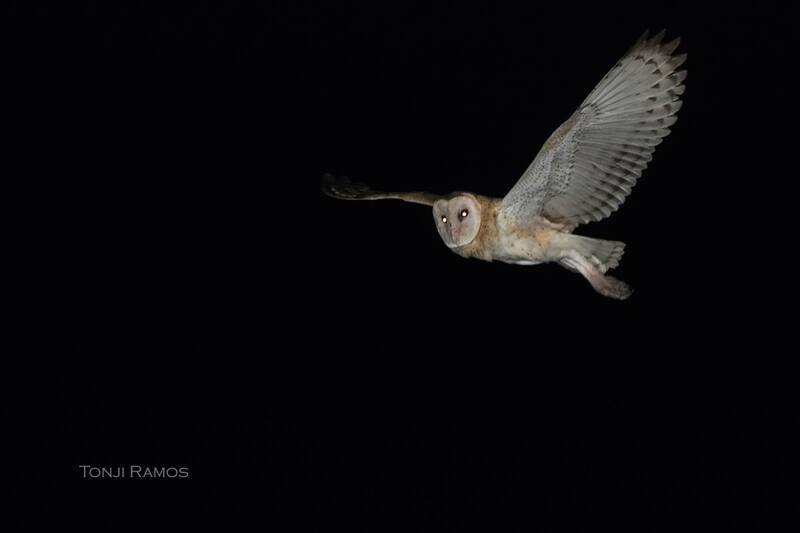 Tonji’s picture of an owl in flight at night. The next month we saw something new. 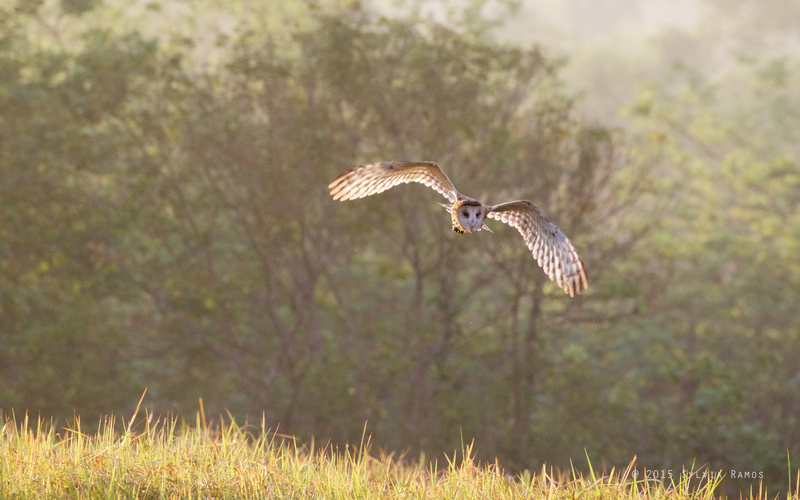 We saw an owl hunting in the daytime. Over the years we suspected that the owls were roosting in our place but hunting somewhere else. We never saw them hunting in our place. Then one afternoon we saw a Grass Owl fly past our cottage, disappear past the trees, then reappear and fly low over the grass. It repeated this several times. This is hunting behavior! Early the next morning we had a repeat, extended performance! I was taking pictures of the owl from the veranda of the cottage from 5:59 am to 6:45 am! We were just glued to the veranda. We also didn’t want to scare it off by pursuing it. Thank goodness the dogs did not try to go after it either. We never saw it catch anything though. It is heartening to see how far we’ve come along in 3 years. On Year 1, we were clearing big swathes of invasive hagonoy and aroma from the fields to allow other types of grass to grow. We were also busy with our cottage and other infrastructure. I was worried that the sudden influx of human activity scared away the birds that were used to seeing just cows and carabaos. Tonji doesn’t think so. On Year 2 we did a lot of tree planting and I was busy with my issues with Batman, my horse. We also expanded our area. Year 3 was when we started making ponds that we hope will turbo boost the plant growth and wildlife activity in our area. I am looking forward to seeing what Year 4 brings! Aside from the ponds, I’m looking forward to seeing more forest birds when Tonji starts making the forest trails. Wow! Ducks AND owls! I’m sure your farm will be revealing several more surprises in time! Yay! I’m looking forward to that!! One of the things I’m hoping for is a picture of the Blue-breasted Quail. We have no pics of that bird yet. Would be great to get our first pic in our place!